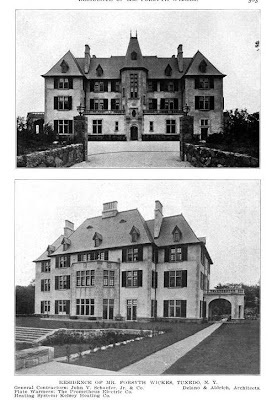 'Gray Crag', the Forsyth Wickes estate designed by Delano & Aldrich c. 1909 in Tuxedo, New York. Wickes, a lawyer and co-founder of the Columbia Law Review, was a partner with the firm of Wickes, Riddell, Bloomer, Jacobi & McGuire. He was also a noted collector of 18th century French art and porcelains which his 1964 NYTimes obituary called "outstanding". The McMillan Company's Great Private Collections published in 1963 listed the Wickes collection as one of the 26 outstanding collections in the world and one of 10 in the United States. 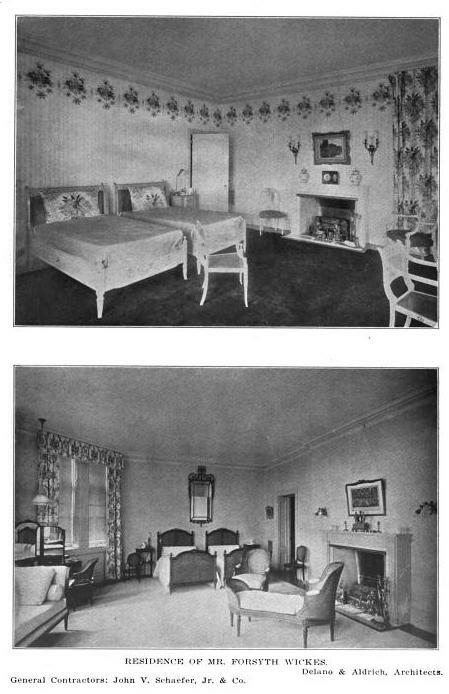 The home is extant (but yet to be located). 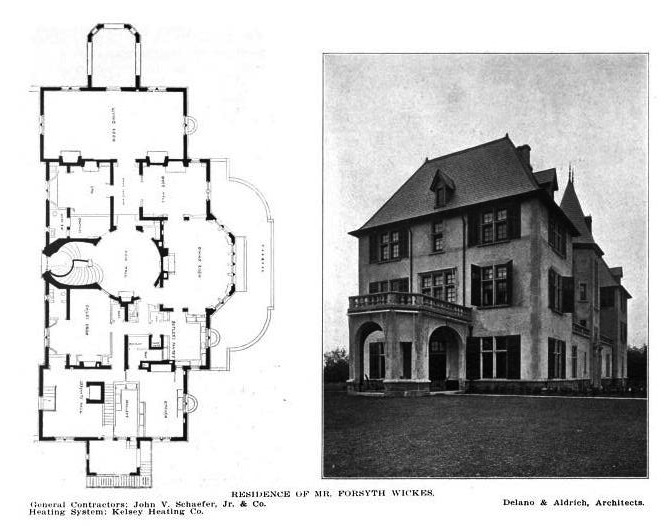 Photos from Architects' and Builders' Magazine, 1910.
wow -thats a huge house. Odd that none of his collection seems to be in evidence in the photos though! It is also noted that the stable remains, as a residence, in near-original form. I’m having a hard time finding it on Bing. This house, greatly reduced in size and scale, was listed for sale about two years back through Sotheby's. 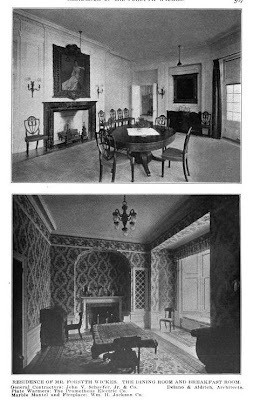 As I recall the top two floors were removed and the only noticeable remnant of the original house is the large bay window. The renovations were not successful. The exterior was finished in pink stucco. Sad. This explains everything. I remember seeing pictures of this place when it was for sale, and thinking it was a very odd looking duck indeed, even for early Delano & Aldrich (before they hit their stylish mature stride). Now all is revealed. Here is the Tuxedo house as it appears today: http://www.luxist.com/tag/tuxedo%20park/ Be sure to click on the gallery---the ceiling fresco in the hall has to be seen to be believed. Interesting, also, to compare the entrance facade here with Ralph Laurens Bedford house, done a dozen or more years later, to see how they used essentially the same composition after taste had shifted from the grander Beaux arts ideal. Incidentally, to any of you who have never seen Tuxedo Park, sell your grandmother, bribe the guard at the gatehouse, call in an old debt, whatever you have to do, to get in. 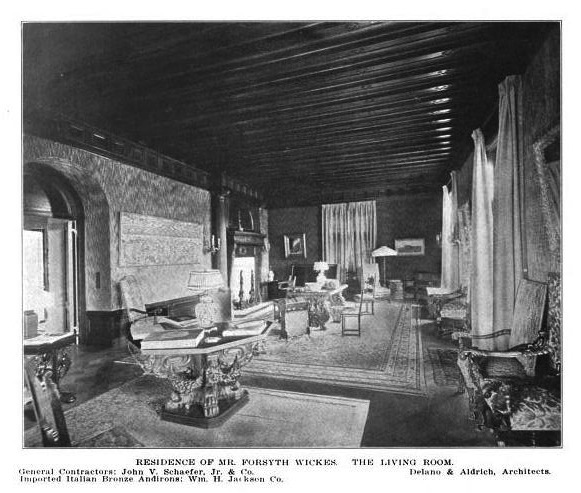 It's as intact a little slice of the Gilded Age as you'll find. Duh, why don't I ever think of these things all at once, in one comment. 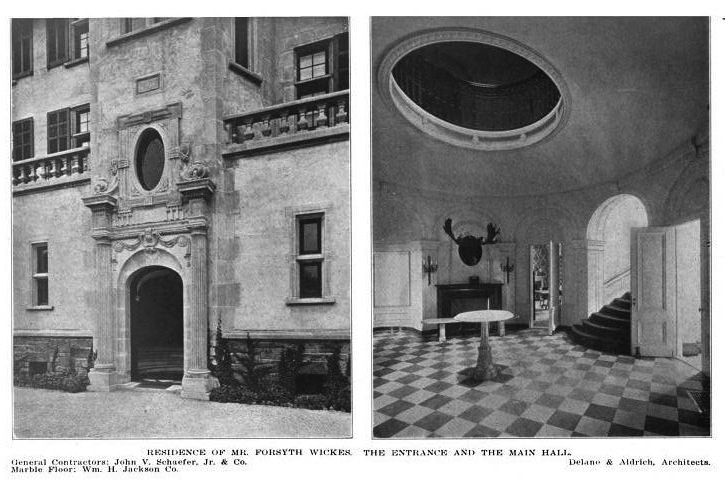 For that matter, also take a look and compare this with what they did for Otto Kahn on the entrance front at Oheka, also a mature, and very grand, reworking of the same themes. Down East Dilettante - Thanks for that shot on Bing - I saw that house as I looked, but I never would have guessed it as Gray Crag! And I totally missed the not-so-close stables. Why is Bing so weak over Tuxedo Park? I recall this house from the WSJournal's House of the Day back in October 2010. You gotta love that hall and staircase. And the teahouse. I have mixed feelings about that recessed entrance. Perhaps it was an interesting progression of space, though. I'm absolutely dumbfounded however this magnificent facade morphed over the years to the home it is now. Who could strip away such character into what is a quirky big box? Like others I never connected the dots between this house and the one being peddled as "Topridge" with D&A never uttered as the original architect. The home was auctioned for a pittance compared to its prior sale and as well as the last asking prior prior to auction. Per the WSJ: The Tuxedo Park, N.Y., home sold for $2.3 million in November 2010. Original Price: $9.8 million. Taxes were $87,050 in 2010 and no central air conditional at time of auction. I've been smitten with the architecture found in Tuxedo Park even today after so many homes being razed over the years. The gentleman behind the blog Big Old Houses has a few times posted images and the backstory of properties he lived in there in Tuxedo Park. Just delightful. 2013 update ... 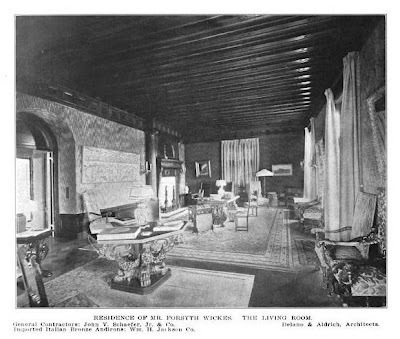 If you wanted this defaced Delano & Aldrich mansion and missed the auction you're in luck. The rub is that you have to write a bigger check than the prior buyer did. Yes indeed with seemingly nothing invested in the property it goes from $2.3M to an asking $3.85M. I'll be impressed if she can pull off such a rich flip when all TP estates listed as of late have languished even after prices have been dropping. Actually, substantial improvements have been made including central air conditioning. In addition, all mechanical and electrical systems have been updated(and there are a lot of them!). Update - House has been taken off the market though I understand you can still buy it directly through the owners.